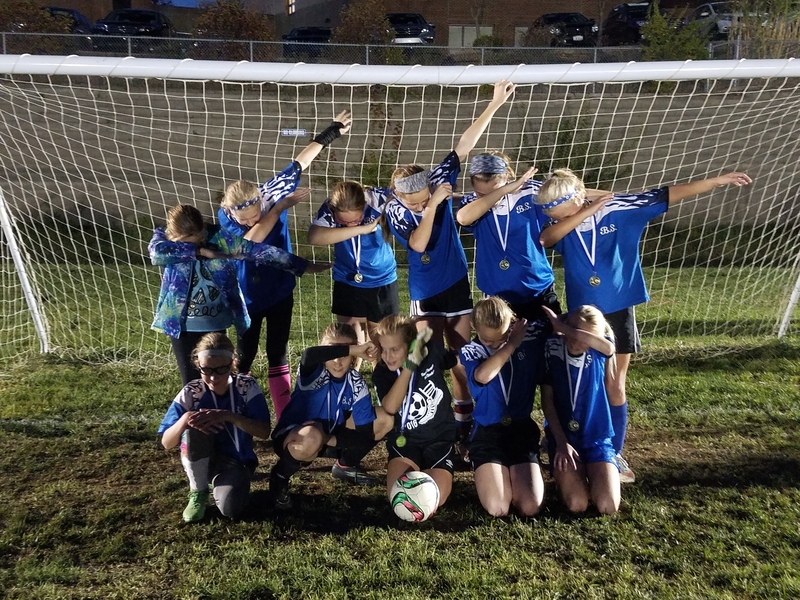 All girls and boys ages 4 to 16, currently parishioners at Blessed Sacrament Church, are welcome to participate in the Blessed Sacrament Boosters soccer program. Players outside of the parish are allowed to play on a Blessed Sacrament team upon approval of the Soccer Committee, and approval will be based upon the need to fill remaining spots on particular teams, or if that child is attending Blessed Sacrament School as an out-of-parish boundary student. Blessed Sacrament Boosters soccer is a recreational soccer program. Teams are formed by the Soccer Committee in accordance with the Northern Kentucky Soccer League (NKSL) policies for recreational team formation. Every attempt is made during team formation to make teams have parity and relatively equivalent age distribution. Under no circumstances are teams or players placed on a team to create a “select” or upper level talented team. Players may be placed on certain teams due to family circumstances such as practice time and/or transportation difficulties. Coaches of individual teams are not allowed to select certain players for their teams other than their own son or daughter and their assistant coaches’ son or daughter. Teams are broken down by age groups of Under 6, 8, 10, 12, 14 and 16 with birthdates in accordance with NKSL guidelines. Birth Certificates may be required by the request of the Soccer Committee. Each team will have only one Head Coach and one designated Assistant Coach. There are no tryouts to participate on a Blessed Sacrament Soccer Team. Parents are required at the time of signups to provide the Soccer Committee with information on any physical limitations their son or daughter may have that may affect their playing ability. The number of players on each team will be determined by the Soccer Committee based upon the Kentucky Youth Soccer Association guidelines for small-sided and large-sided play as well as by the number of players that sign up for a particular age group in a given season and the availability of experienced coaches. If any one age group does not have enough players to form a team, some players from the next lowest age group may be invited to play up only with their parent’s prior permission. The Soccer Director and Committee will put forth a good faith effort to locate a coach for all players that sign up within the seasonally determined time frame. However, if a coach cannot be located by the director or committee a team may not be able to be formed. Generally, only players that sign up late could be impacted by this policy. All Blessed Sacrament sports programs require the presence of two adults at each practice and game. Parents, on occasion, will need to help the coaches with this required supervision. All coaches and helping adults must be Virtus trained. In order to ensure proper supervision, it is imperative that players be dropped off and picked up promptly before and after practices and games. Children should not be left unattended at the soccer field. A parent must be present until the coach arrives. After practice the coach(es) must stay until all children are picked up by parents. ALL players will play at least 50% of each game based upon attendance, attitude, and attention at practices and games. Coaches will be instructed to be fair and reasonable. A coach may limit playing time for poor attendance, defiance, fighting, drinking alcohol or illegal use of drugs, or poor sportsmanship by either parent or player. We will encourage our coaches to communicate regularly with parents and players regarding player progress and development of skills, sportsmanship, teamwork, and participation. In addition, parents are encouraged to communicate with coaches. We ask you to remember that our coaches are volunteers and not paid professionals. DO NOT confront a coach with negative comments or criticism at a game or practice. If you or your child are having difficulty with any particular coach, please call or email him/her in private and try to discuss any differences in a positive, professional, and adult manner. Any issue not worked out between the parent/player/coach may be directed to the Soccer director and ultimately, if necessary, to the Booster Board. BSS Athletic Boosters will provide uniforms. Parents will provide shinguards and proper shoes. Parents comments of a non-positive nature are not to be voiced during/after games and practice. Officials have the discretion to control team/fan behavior ranging from verbal warning to forfeiture and/or removal from the field. Sportsmanship among players, parents, and fans on and around the field of play will be enforced. Teams whose players, parents, or fans are behaving poorly will be reported by the affected league’s director to the offending school, league, and/or NKSL director for a warning or suspension.